I’ve just placed an order with Seeds of Change for the second round of veggies that I’m starting from seed this year. I already have one tray growing in my kitchen, but I’ll get around to that another day. Included in this recent order is a packet of corn seeds. Corn is something that I have never grown at home - not in my mother’s vegetable garden, not in my own garden from nursery seedlings and certainly not from seed. However, having become somewhat obsessed with the stuff over the past year, I knew I had to have it at the ready in my backyard this summer. Paying no attention to seasonality or how far the corn has had to travel to reach my kitchen from someplace warm enough to grow it, I buy it when I see it and I use it quickly. Most of the time I don’t even bother cooking it. I cut it right from the cob and toss it with some chopped mango and a squeeze of lemon juice. The only thing that surprises me about my order is how long I’ve waited to grow my own. Did you know that the sugar in some corn varieties can turn to starch less than 24 hours after harvesting? I’m definitely looking forward to harvesting right before cooking. With corn on the brain (and three ears in the fridge), I started flipping through recipes looking for something to make. I recently printed my first recipe off of Bravo’s Top Chef site. It’s a chilled corn soup recipe from Jamie Lauren. She rocks at making soup and I seem to remember the judges loving this one. Who am I to argue with Tom Colicchio? The judges were not wrong. 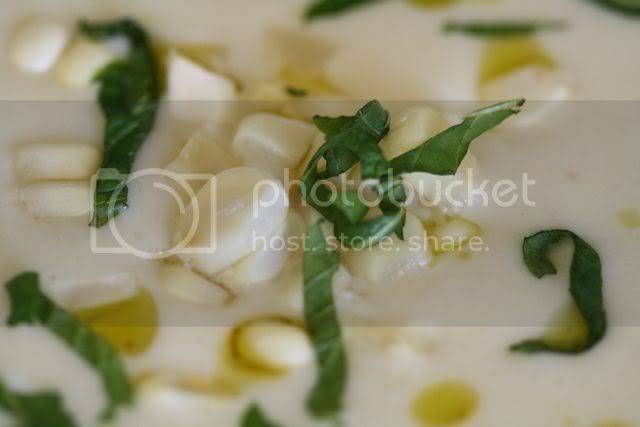 This dish is delicious and definitely not your ordinary corn soup. It’s served chilled and the hint of mint that comes through is refreshing, not overpowering. Whatever you do, don’t skip the kernels of corn as a garnish. The crunchy bursts of sweetness were perfection. And when making the chili oil (or handling chilies at any other time), don’t do what I did and accidentally touch your eye. Burn, burn, burn. A temporary distraction from the delicious soup. Cut corn off the cob. Heat butter over medium heat, smash garlic and add to pan. Fry until fragrant and just beginning to color, then add onion. Sautee until the onion is translucent and soft. Add the celery and sauté until soft. Add the potato quarters, corn and mint with a healthy pinch of salt. Cover with vegetable stock and bring to a simmer. Let simmer until the potato is soft. Remove the mint. Puree soup in a blender in three batches, adding 1/4 cup of cream to each batch. Strain the soup and chill. 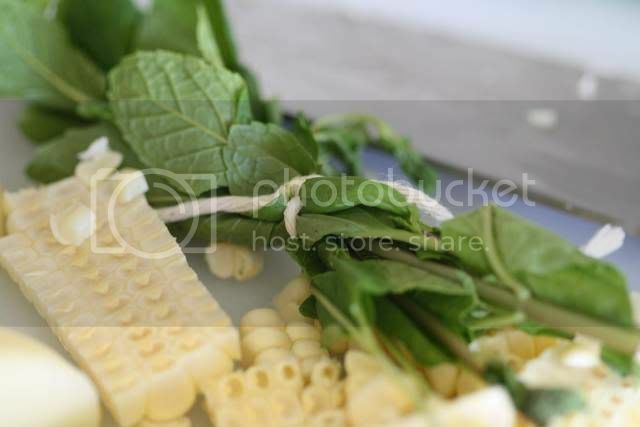 Serve topped with corn kernels, mint and chili oil. Heat the oil gently over low heat and add chilies. Let steep for 10 - 20 minutes until the chilies have released their flavor and some color into the oil. Looks so smooth and creamy...love the addition of chili oil! This looks so delicious, I'll try it for dinner! Thanks for sharing this recipe! I remember watching Jamie make this on Top Chef... it look great though I´ll have to wait a few months before I´ll be able to make it here. I am the hugest fan of mint in soup. Lately I've been using it dried in various Turkish-influenced soups, but this sounds like a lovely way to do it. And Jamie is totally my favorite. First off, thanks for stopping by Organic Spark! I am going to add you to my Blog List b/c I am back for more from your site. I like it a lot! And I too am a top chef fan. My foodie neighbor and I get together every week to watch. And I totally remember this soup. Jamie cooks how I like to eat. And your soup looked just as gorgeous and scrumptious! 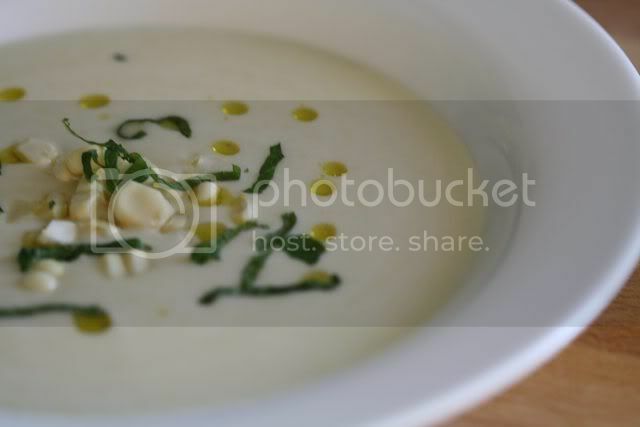 Love Top Chef and I remember this soup. It rocked and yours looks soooo delicious. This looks so beautiful, I remember the judges really liked it too! Ohh looks good, I can't wait till corn is back in season. I have heard that factoid before and it makes perfect sense because corn straight off the stalk is crisp, sweet and milky without even a hint of starchiness. Looks amazing! Good for you for growing your own corn. My Grandfather grew corn in his garden and I used to love to help him and my grandmother pick it and shuck it. Thanks for bringing back some good memories! I saw this I believe. It looked delicious then and it looks delicious now. Nice! I love Jamie Lauren and trust her recipes!! She did a piece in palm springs recently, checking out the local "eats". Basil Ice cream!!! ?!?!?!?! I made this soup tonight, and cannot WAIT to eat it tomorrow! Healthy, sweet, salty, savory, fresh, AMAZING!!! I love the combo of flavors! I just had jaw surgery, and am trying new recipes, and this is DEfINITELY a keeper! !